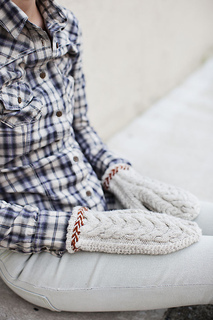 This pair of mittens is laden with sculptural cables on the hand and adorned with a simple, textured “sled” stitch on the palm. The two given sizes are achieved by working the same pattern at different gauges. The shaping for the thumb and lower hand is slightly unusual: unlike a traditional thumb gore, Flint’s thumb stitches are already present at the base of wrist. Stitches are increased on both hand-top & palm to shift the thumb outward in a diagonal direction for a comfortable, anatomical fit. 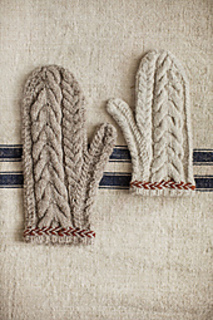 The base of the cuff features a ribbed turned- hem as well as an optional 2-color Latvian braid accent.